Defrost spinach, drain as much water out as possible with a colander. Cut eggplant in rounds, thinly sliced. Chop 1 tomato and slice 1 tomato. Slice mushrooms. 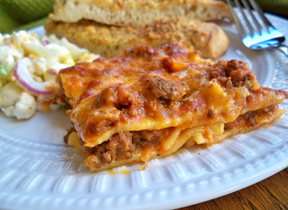 Cook lasagna noodles until tender. Mix ricotta cheese with spinach in a bowl. Salt and pepper and season to taste. 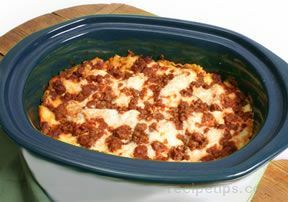 In a casserole pan, spread a light layer of sauce. Add layer of noodles, then eggplant, mushrooms, tomatoes, sauce, and ricotta cheese/spinach mix. 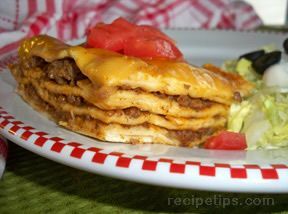 Sprinkle mozzarella cheese in each layer as desired. Repeat process until pan is full or desired height is achieved. Top with remaining mozzarella cheese, tomato sauce and cover evenly with thinly sliced peeled tomatoes. Sprinkle on parsley flakes and parmesan cheese. Bake at 350° for 45-60 minutes, until eggplant is soft and has changed a brown color.